Nick Cotric said he isn’t distracted by the speculation of playing State of Origin. Photo: Supplied by Canberra Raiders. 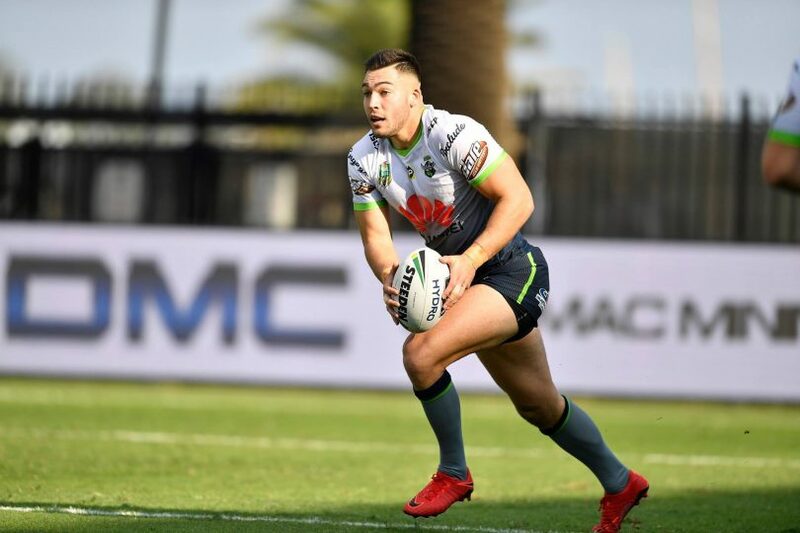 Canberra Raiders winger Nick Cotric said an Origin debut would make his dream come true but insists he isn’t distracted by a potential call-up to the NSW squad. Blues coach Brad Fittler said the Green Machine winger was a bolter for the NSW squad last year and his impressive start to the 2018 season has only added fuel to the speculation. Since his debut last year, the 19-year-old has been in exceptional form with 19 tries in 33 games for the Canberra Raiders. “I don’t really focus on [talk about Origin]. I just focus on the Raiders and how I perform every weekend for the club and that’s the main thing,” he said. The winger said he had not been approached by Fittler but backed himself to fulfill his dream of playing Origin if given the opportunity. “It will definitely be a huge step up but I’ll take that opportunity with two hands,” Cotric said. “Since I was little kid it was always a dream of mine to pull that Blues jersey on. The Green Machine enters their clash against the Sharks on Sunday afternoon (13 May) full of momentum, having lost just one of their last five games. Despite the Raiders beating the Sharks 30-12 when they met last season, the Canberra local said the Raiders were ready for a tough game on Mother’s Day. “It is going to be a tough one at GIO Stadium. I remember last year, they ended up flogging us at GIO so all the boys are keen and ready to play this weekend and hopefully we get the win,” Cotric said. Canberra Raiders vs Cronulla Sharks at GIO Stadium, Sunday 4:10 pm. But your tickets from Ticketek. Raiders: 1. Jack Wighton, 2. Nick Cotric, 3. Jarrod Croker (c), 4. Joseph Leilua, 5. Jordan Rapana, 6. Blake Austin, 7. Aidan Sezer, 8. Iosia Soliola, 9. Siliva Havili, 10. Shannon Boyd, 11. Joseph Tapine, 12. Elliott Whitehead, 13. Josh Papalii. Interchange from: 14. Ata Hingano, 15. Luke Bateman, 16. Charlie Gubb, 17. Dunamis Lui, 18. Liam Knight, 19. Michael Oldfield, 20. Craig Garvey, 21. Jack Murchie.